String of Pearls Canyon is located in the Red Rock area of Nevada and makes for a great day trip. A shuttle is set up with the lower car left at the Bonnie Springs Ranch parking lot while the upper vehicle is set up by turning off the 160 onto "Williams Ranch Road", heading to your left onto "Rainbow Spring Bottlebrush road" where you will curve up and around a fenced off area and find yourself at the trail head just up and around the corner. This upper vehicle road can require higher clearance to get up to the parking/trail head. Hiking up the obvious trail will gradually lead you up to the ridge line (the trail eventually curves distinctly left and down a hill, continue straight, directly up the ridge. This is where the main trail you had been following is left). Following the ridge line from this point on is a trail (faint in some places) that basically keeps you on the peaks working your way into the drop in point. 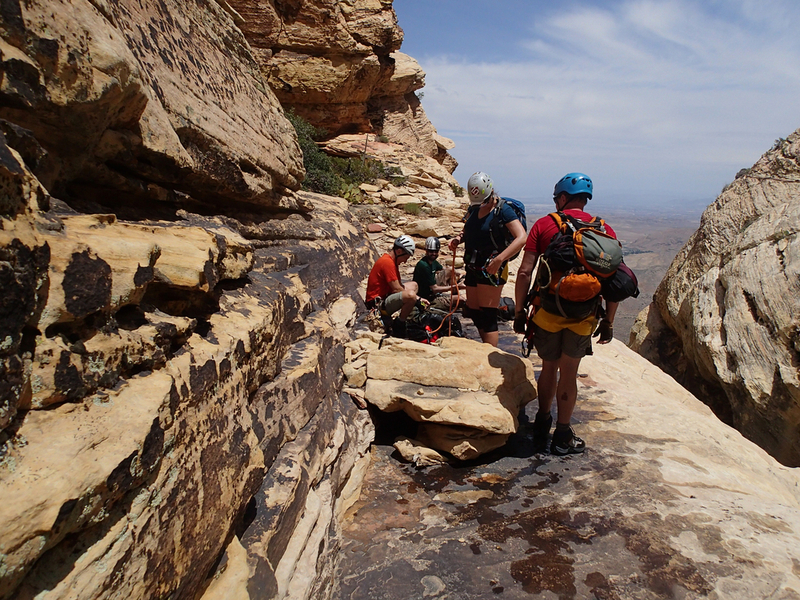 You will soon find yourself exiting the rocky/brush filled terrain and entering a smoothed sandstone section, when visible you are essentially at the beginning of the technical section of String of Pearls where you may encounter nearly a dozen rappels (Depends on your approach, down climbs are jumps may be available). Once at the first rappel it seems the locals request a retrievable anchor be used, please do so! There are many great spots to easily rig a retrievable anchor and the lack of obvious webbing allows day hikers to enjoy the area without distractions. Once in canyon, things are pretty straight forward and I don't recall any situations that would warrant extreme caution. There are several cairn anchors in the canyon, it is recommended to have the first person relay to the back of the group conditions ahead in the event improvised anchors need to be constructed. One area in particular had a crack in the main chute that was sticky (test pull dropped directly in the crack). This was easily avoided by having the last man start the rappel over top of the large obvious boulder, allowing the rope to be pulled easily without any concern. Once you finish the technical section and gear down, its a decent bush whack/boulder hop to the exit trail. Bonnie springs ranch is the target and its buildings are visible to hike towards. Although there is a trail/road leading directly into the heart of the ranch, the route here loops you around so your group is not a nuisance to the guests who drive here as a day trip to enjoy the grounds. Once you get your packs off, the ranch is an entertaining place to stroll around, grab a cold drink, and check out the animals. Finally make the drive back up to retrieve your shuttle and call it a day.